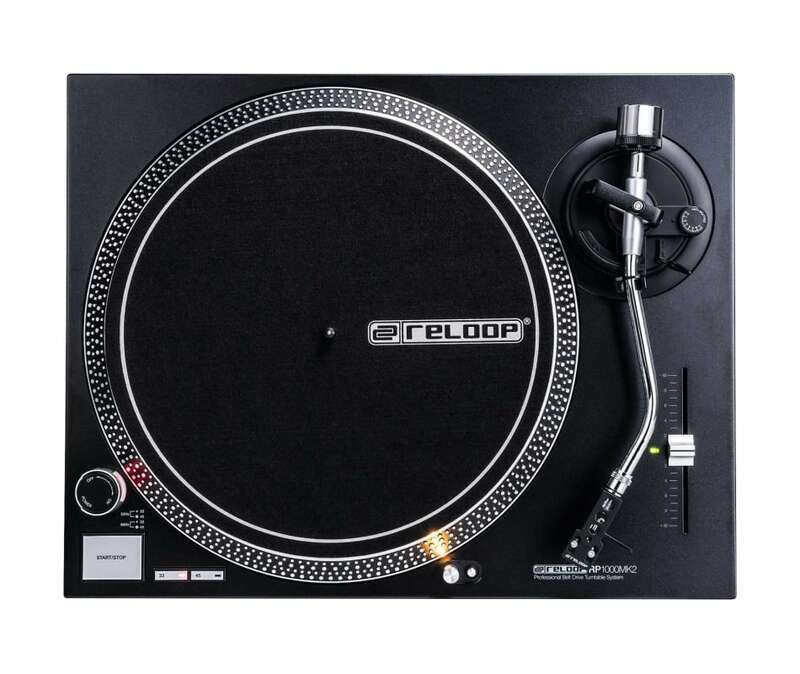 The Reloop RP-1000 MK2 is a powerful belt-drive turntable designed for HiFi enthusiasts, audiophiles, and DJs practicing at home, or performing at parties and gigs. The MK2 features a redesigned top panel, reinforced housing construction, and reworked metallic buttons with improved feel and tactile response. The belt-driven motor de-couples the drive unit from the precision-engineered platter and chassis, while the high-quality elastic rubber belt absorbs and reduces unwanted vibrations, resulting in distortion-free playback. The sturdy, reinforced construction and a die-cast aluminum platter allow the RP-1000 MK2 to withstand the rigors of on-the-road wear and tear. Speeds of 33-1/3 and 45 rpm are manually selectable via dedicated top-panel buttons, and a precision fader allows easy pitch control up to +/-10%. The S-shaped tone arm is statically balanced, and features a hydraulic lift and an anti-skating mechanism. Shock-absorbing feet isolate the turntable from vibration and sympathetic resonance. The RP-1000 MK2 utilizes gold-plated RCA phono outputs and a grounding connection for standardized hookup to a phono preamp or mixer. The universal connection accommodates the included Ortofon OM Black pickup system and allows you to swap to your own preferred SME model (available separately). The RP-1000 MK2 is supplied with a slipmat, a removable headshell, a counterweight, and a power cable.